8 Restyling & tRuck AccessoRies | May 2015 restylingmag.com "Many of our clients are past enthusiasts that still like to have their vehicles and toys upgraded, but don't have the time to be a DIY guy anymore. That type of cus- tomer appreciates dealing with someone with a strong knowledge in what they are doing." In recent years, Extreme Audio also has expanded into a range of truck accessory markets, offering bed covers, wheels and tires, step products, lighting and liners. "The truck market is a logical exten- sion of our business," Bartells says. "In mobile audio, the general trend is cheaper, cheaper, cheaper. In the truck accessories market, you can escape some of that down- ward pressure because you've typically got a more affluent customer who is willing to spend a bit more for quality. That's the perfect customer for Extreme Audio." In order to attract and maintain that discerning clientele, a shop needs talented employees that share a dedication to excel- lence, Bartells says. Finding and keeping that type of top talent is among the greatest challenges facing all shops in the automo- tive aftermarket. 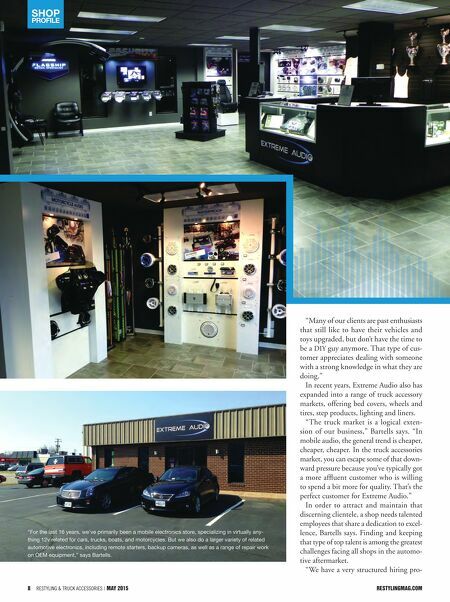 "We have a very structured hiring pro- Shop profile "For the last 16 years, we've primarily been a mobile electronics store, specializing in virtually any- thing 12v related for cars, trucks, boats, and motorcycles. But we also do a larger variety of related automotive electronics, including remote starters, backup cameras, as well as a range of repair work on OEM equipment," says Bartells.